Today I final drilled and deburred the remaining #40 holes in both the spars. Then I counter sank the rivet holes for the spar flange nut plates. A few of the 116 counter sinks on the left spar. Nut plates riveted to the top flange of the other spar. After thinking about it over night, I realized that the j-channels could be clamped to maintain a 1/16" overlap on the spar flange even if the spar has a slight camber. I'd just have to make multiple measurements along the channels to make sure they have the same camber while I'm drilling. Here I've clamped the channel to the spar flange with the 1/16" overhang and I'm drilling the first hole. I used the tail of my micrometer set to .0625" to set the channel overhang. I measured, clamped and then drilled and clecoed 8 locations before proceeding with the rest of the holes. Drilling the remaining holes was a sit down job- lots of holes! 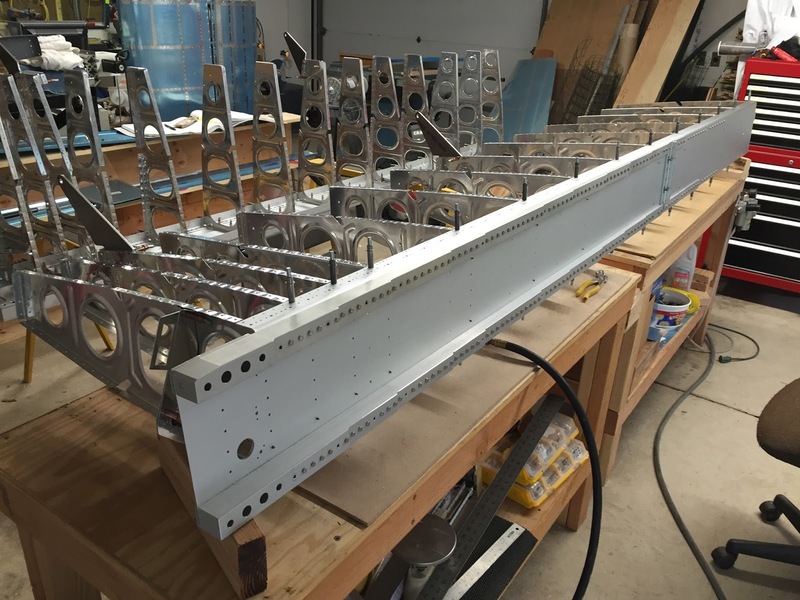 Here are the j-channels for both wings match drilled to the spar flanges. The blue tape on the bottom flange of the spar is for where holes are skipped. The last step in match drilling the j-channels is to flip the bottom channels 180 degrees and then attach them to the top flange for drilling the 3 areas that were skipped (see blue taped areas in picture above). When you rotate and flip the channels they then cleco on the top flange with the j portion sticking up. 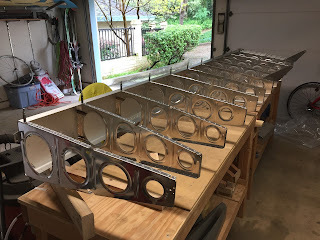 I cut the wing j-channel pieces to length and prepared to match drill them using the holes in the flange of the spars. The manual suggests blocking the spars so they are level on the table before clamping the j-channel pieces onto the spar flange. I started blocking and discovered that the spars come with a little camber built into the section where the heavy spar caps are riveted to the spar web. I laid the spars back to back and blocked the bottom spar. You can see about an eight of an inch gap between the two spars. I could squeeze them together without too much force, so I am assuming when the wing skins and leading edge components are clecoed on the spars will straighten out. I laid out the two spars on the table and clamped them in place to hold them flat. They still aren't totally flat so I decided to knock off for the night. I primed the ribs and flap support brackets for the left wing. I spent the whole day prepping the left wing ribs for priming. I degreased with soap and water and then acid etched and scotch brite scoured 14 ribs and the flap hinge brackets. I drilled the systems holes into the ribs for the right wing and deburred them. The construction manual instructions and drawings for the systems holes didn't add up in the Rev. 1 version. I downloaded the latest Rev.2 drawings and it still wasn't completely clear. I ended up drilling holes for the specified bushings. The number and placement of the holes varies as you move outboard. I dimpled all the rivet holes in the bottom flange of all the ribs using the pneumatic squeezer (616 dimples). 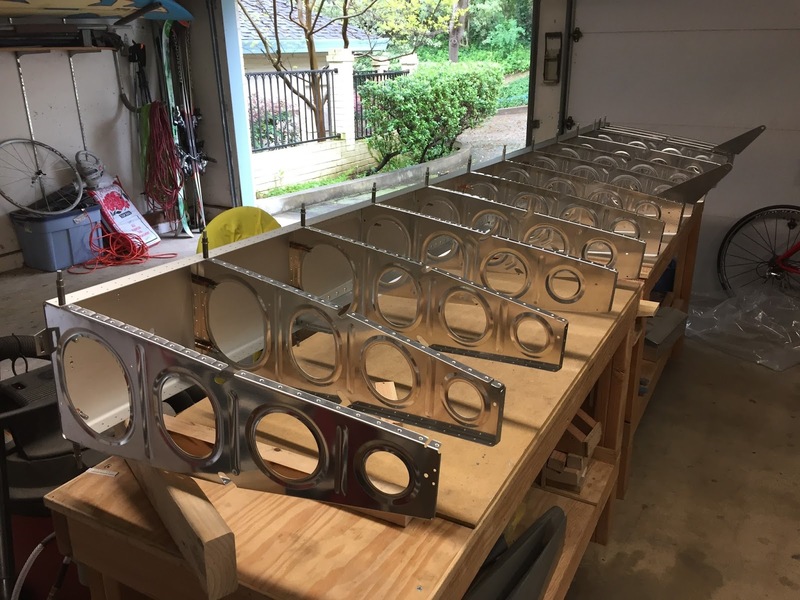 Next I finished the edges and assembled the torque tube support subassemblies and final drilled and deburred all the holes. I had to move the flute in the rib slightly off center between the rivet holes to provide clearance for the bracket. I flattened out the original flute, marked the new location and then squeezed another flute. I finished up this afternoon assembling and drilling the 4 flap hinge assemblies (two shown here). I had already finished the edges and straightened the flap hinge brackets right after unpacking the wing kit back at the end of October, so this task went fairly quickly today. I'm back to working on the wings. 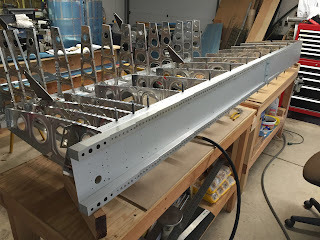 Today I worked on finishing the edges of the 28 wing ribs. I ran all the edges over the grinding wheel and used the die grinder to deburr all the interior cutouts. Then I final sized all the flange rivet holes using a #40 reamer in the air drill. The reamer leaves very clean holes, but I still did a de-burr pass after reaming. Each rib has 44 holes so that was 1,232 reams and 2464 de-burrs (one for each side of the hole). Lots of work with little to show other than a big stack of ribs! I trimmed the counter weights and fastened them to the arm of the elevator. The bolts are torqued to 28 inch pounds and marked with torque seal. The piano hinges aligned nicely and the trim tab moves with little resistance. Everything seems to have aligned nicely and the trailing edge looks straight. This is the first moving surface I've completed! I put together the trim tab servo mount and linkage arm. I need to get a wire crimping tool to attach the pins to the ends of the servo leads, so I didn't install the servo to the elevator yet.